Staff from BT’s Edinburgh office got on their bikes today to launch the Pedal for Scotland Gold Team Challenge. The annual Glasgow to Edinburgh bike ride, which regularly attracts 10,000 riders, is back on 11 September 2016 and teams of three or more can opt for a dedicated Gold entry where they can take advantage of a host of extra benefits including fast track start line and feed station lanes, baggage transfer and showers at the event village. 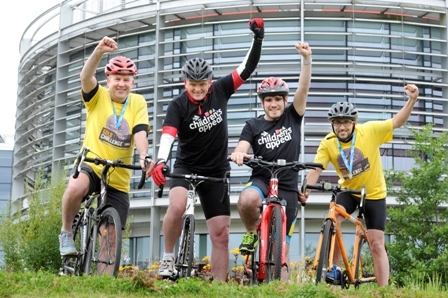 Team BT will taking part in the 46 mile Classic Challenge ride which will see thousands of riders cycle from Glasgow to Edinburgh, sampling the famous home baking at Avonbridge and lunching in the stunning grounds of Linlithgow Palace along the way. Pedal for Scotland, organised by Cycling Scotland and funded by Transport Scotland, offers rides suitable for all ages and abilities. Gold Team Challenge riders can choose to ride the iconic 46 mile Glasgow to Edinburgh Classic Challenge or the epic 112 mile Big Belter. All rides will finish in the Royal Highland Centre where Pedal for Scotland Gold Teams can take advantage of free showers and dedicated Gold area, or simply relax in the event village.